I've got log cabins on the brain these days. 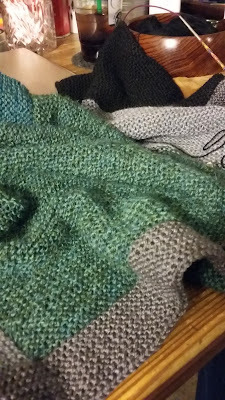 It doesn't look like much in the photo, but my log cabin shawl is growing much faster than I anticipated it to. I only knit on it at night when I'm watching TV. Yikes. Perhaps I watch too much TV. I'm knitting the log cabin with two strands lace weight yarn held together. I'm using five skeins of Knit Picks' Gloss Lace, one skein of Shadow and a partial skein of Alpaca Cloud that I found deep in the stash pile. I'm also cheating a little bit and using my interchangeable needles and as I finish a section, I'm leaving the cables in so that when I circle back around, the stitches are still live and I don't have to pick up quite so many. It's a big time saver but having all those cables hanging off it is making the project look like a scary freak show. And the yarn is constantly wrapping around the cords' end caps so I'm really not sure if I'm saving time or not. You'll find yarn color details.... on my Ravelry page if you're interested. 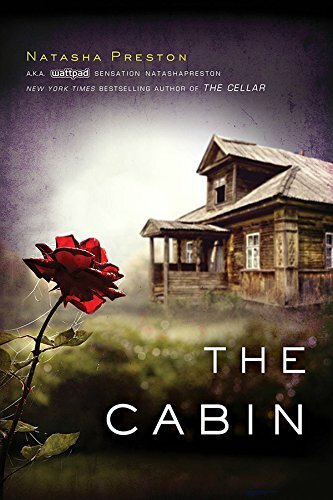 Besides knitting a log cabin shawl, I've been reading The Cabin by Natasha Preston. I finished it last night and although it was one of those 'the teens have to solve the murder because the police can't' stories that drive me crazy, I enjoyed the book all the way to the end. I have several cabin themed books in my que but.... I can't decide which to read next. love your knitting (and the two strands held together!) and the book sounds like it might be a fun read. Thanks! The 2 strands are making the project go a lot quicker & it's helping with stash reduction. Log cabins are a great way to use up odd bits from the stash pile. Your shawl is absolutely gorgeous! And, I love the cabin theme you have going on here! The shawl is so lovely. I'm thinking of a log cabin blanket...but in something pretty bulky so that it won't take FOREVER! And thus, the 2 strands held together. :) Five of the skeins came together as a kit and I kept thinking.... striped lace or 5 lace shawls.... And I'm on a yarn diet & not allowed to buy new yarn until I've emptied a drawer full of yarn... And thus, 2 strands held together. Thanksfully, it's knitting up faster than I expected it would. Your shawl looks so snuggly! Love the colors you are using, the shawl is going to be gorgeous.